We supplyTyvek paper Wristbands, Fabric Wristbands , Plastic and Silicone wristbands suitable for your festival or special occasion anywhere in UK and Republic of Ireland. Various colours and designs based on music festival, Dog Shows, fairs, including Christmas and New year themed wristbands are available in ready stock. You also have the option of ordering your own customised design for your special occasion, festival, celebration or event. We have a special online tool to help you design the special festival wristband of your choice and you also have the option to email us your custom design. 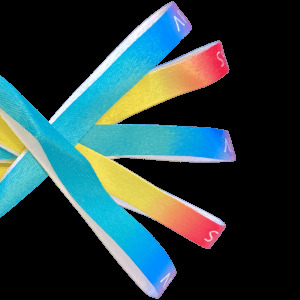 Our advanced online designer tool makes it easy to customise both paper wristbands and fabric wristbands on your computer screen. For more complex printing, or in case you already have the design of your customised festival wristband ready you can email it to us. Festival wristbands are used as an effective means of identification and access. They are a great way to prevent unauthorised access to you festival or event and also to make sure that your guests can enter only the area or areas for which they are authorised. For example during the London new years fireworks display, two types of wristbands are provided. One type of wristband allows helps residents and businesses get into specified surrounding areas without needing proof of address. The ticketed area festival wristband allows authorised ticket holders into the specific viewing area. Our festival wristbands made of paper provide an economical way for access control for an event of one day. In case you want that your wristband should last for a longer period you can use a wristband made of fabric (cloth). 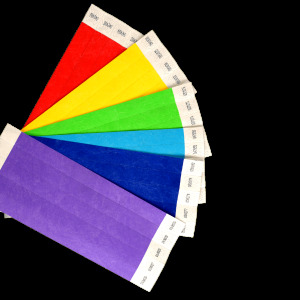 Tyvek paper Wristbands or simply Tyvek Wristbands are a secure, convenient and affordable method to identify customers and guests for a large number of festivals and events as well as secure entry to amusement parks, museums, water parks and the like. Tyvek is a synthetic material made by DuPont which looks and feels like paper, breathable, very comfortable to wear, light weight and very strong. 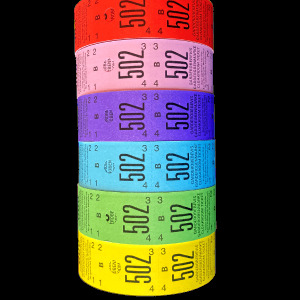 Tyvek Wristbands are difficult to tear and are durable enough to withstand the wear and tear of a dance club or multi-day, outdoor event but can easily be cut with scissors or a knife. Water vapor can pass through Tyvek, but liquid water cannot. 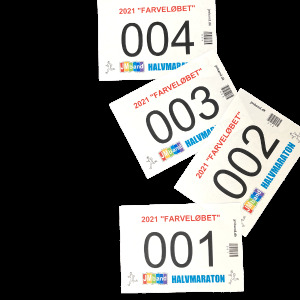 Further Tyvek Wristbands can be printed with any design or colour. You can even print your own special design or festival logo. We use a special tamper evident feature on all of our Tyvek wristbands which will make them unusable in case anyone tries to remove them. In addition, all wristbands including printed Tyvek wristbands can be sequentially numbered for another layer of protection which allows you to determine the consumption of festival wristbands. 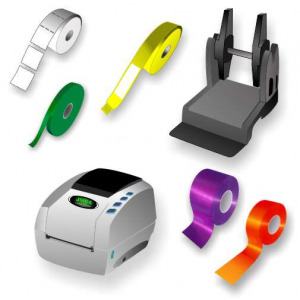 When it comes to Tyvek paper wristbands, we offer our customers high value for money and deliver it in record time. Customers can choose between customised paper wristbands or plain paper wristbands with no printing that we have in stock. A wide selection of solid vibrant colours and exuberant patterns are always available in ready stock. We have developed our own system for printing on paper wristbands and if required we can deliver 100,000 printed paper wristbands next day. We offer a wide range of solutions for arranging a cloakroom with paper tickets or plastic cloakroom tags. Cloakroom Paper tickets are offered in 2 parts and 3 parts both as roll tickets and as booklets. Tickets are marked from 001 to 1000 and are made of high quality thick paper. 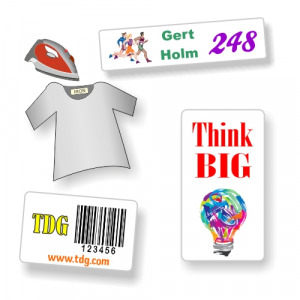 Our plastic cloakroom tags are reusable and are environmentally friendly. We can customise your tickets and tags with your logo and text. 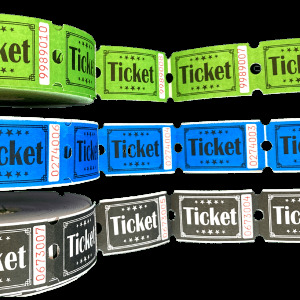 We also supply Drink roll tickets and Admission ticket rolls, both supplied in high quality 'wood free' 120 gsm paper. Drink as well as admission tickets can also be customised as per your text and logo. There are many combinations and options when it comes to Lanyards. 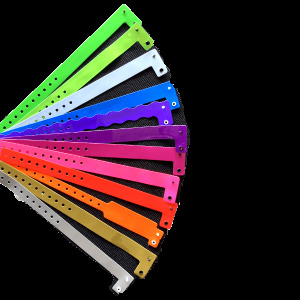 We can help you find exactly the lanyard you need for your application. 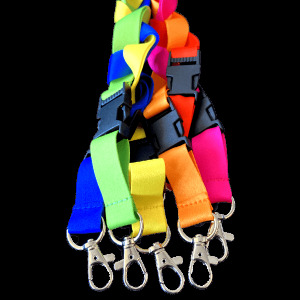 In stock we have colourful high-quality lanyards that we can send out the same working day you order them. If you need customised lanyards we offer silk screen printed or digitally printed lanyards. Over the years we have added a wide selection of high quality tokens and coins to our range of products. 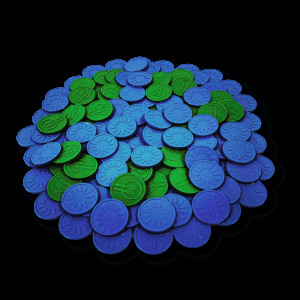 We supply plastic tokens and metal coins in different sizes for various applications. Token and coins can be customised according to the needs of our customers and we also stock standard size tokens and coins for immediate delivery. Today, speed is very important. We are quick to print ourselves on many of the items we offer. 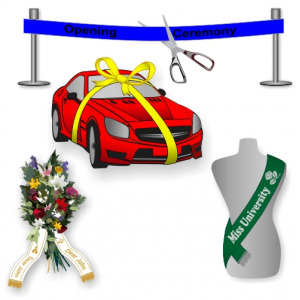 For items we cannot customise ourselves we have partnered with best manufacturers in that sector and we make sure that each individual item measures up to the standard of quality that is expected from us. JMband guarantees the highest standard of excellence. We offer our customers the Price guarantee, Time bound Consignment dispatch guarantee, quality guarantee and a guarantee, that you can return products that are not custom made. In case of any production errors in customised products ordered by you such as paper & woven festival wristbands, printed cloakroom tickets, embossed tokens etc., We will offer to re-manufacture your ordered products as per your exact specifications or a full refund. And it's not just a guarantee, it's our promise to you. All our products are of a high quality in vivid colours and at a very good price. Backed by 25 years of experience. So what are you waiting for? Order Now and see the difference. We are very sure that you'll be delighted with the quality you get for the money. We will ship your order from Aarhus in Denmark and all our orders will be dispatched within 24 hours for items in stock. With more than 25 years of experience in admission control and marking products, we can help you find the right solution for the right price and deliver it the way you want it. We can also supply you products with the exact design and specifications as per your choice. We achieve this by selecting impeccable quality of materials and ensure that each item manufactured is a hallmark of quality. Our customers know that they can rely on JM Band. If we can't do it, we say "sorry we can't take the job" if we can do it, we do it right and on time. Try us and see for yourself. We are here for you.